Rained all night, this area gets an incredible amount of rain so I was lucky not to have any over the last couple of days. Taxi to the Terminal de Omnibus, Asuncion, streets flooded got there at 0710, bus half empty this is a semi cama bus which has 4 rows of seats across instead of 3 as it is not an overnight bus, I had 2 seats to myself, left on time at 0730. Farmland and villages along the way arrived at Ciudad del Este bus terminal at 1255, this is a big place. Got off and on to the direct Cerro del Norte bus to Puerto Iguazu, it has to go through Brazil but does not stop so no Brazil Immigration and Customs only Paraguay and Argentina. 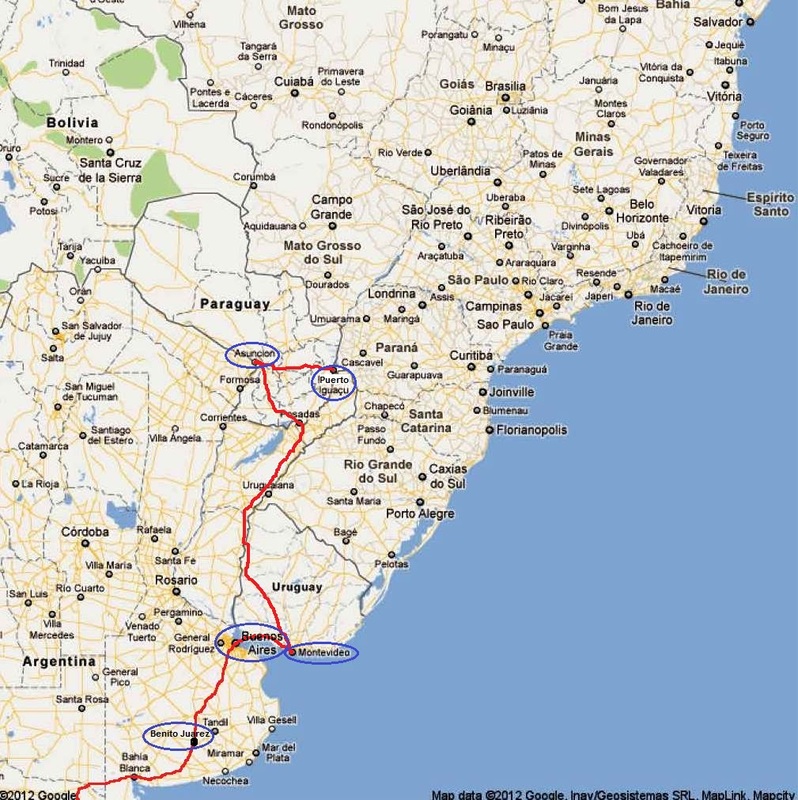 The reason it has to go through Brazil is because the borders between the 3 countries are rivers and there is a bridge between Paraguay and Brazil and then a bridge between Brazil and Argentina but there is no bridge between Paraguay and Argentina so you can’t go directly from Paraguay to Argentina and there is a lot of traffic between these countries a crazy situation hahahaha. The driver said he would drop me off at Paraguay Immigration to get my exit stamp and I would have to continue on the next bus an hour later, PYG10,000 guarani about US$2.50. Bus left at 1320 and got to the Immigration just before the bridge to Brazil at 1335, instead of dropping me off the driver said he would wait so I charged into the building no one else there had my passport opened to the Paraguay entry stamp page and said “Salida Paraguay”, the customs officer did not even look at the photograph page he just stamped my passport, no computer check either and I charged out again 2 min flat hahaha fastest border exit ever. Drove across the Parana River bridge to Brazil and through Foz de Iguacu, big place, no stopping then over the Iguazu River bridge into Argentina at 1425 stopped at Immigration everyone had to get off and get stamped into Argentina then Aduana bags scanned and they made a few open their bags, Argentine people go across the border to shop must be cheaper, I had to open my suitcase because of the tools which were at the bottom, packed up and went outside and the bus had left, they said I could wait for the next bus or take a taxi, decided to take a taxi which I would have had to do from the Iguazu bus station anyway short drive to the hotel 20 pesos $4.50, checked in at 1435. Went for a walk to Tourist Information, this is a small town everything within walking distance got some info about the Falls then walked to the 3 borders lookout where the 2 rivers Parana and Iguazu meet, these are big fast flowing rivers, I could see boats being pushed around by the power of the current. Woke the next day with the flu, headache, body aches and pains, nothing a few ibuprofen can’t fix, short walk to the bus terminal at 0900, 10 pesos 30min trip arrived Iguazu NP, queued up 100 pesos and in at 1000. Walked to the Falls boat ride, this is a joy ride, no rain coat like in Niagara and you get soaking wet including your shoes, socks and jocks and I had to walk around for a couple of hours like that until my quick dry clothing dried out, people wearing cotton will stay wet all day, they do not warn you either when they sell you the ticket, not nice. The falls are an amazing site and spread out over a big area, lots of walking, there is a miniature train that gets you from one end of the park to the other and its packed. I also went on an eco boat ride which was in an inflatable with oars floating down river, back to the hotel at 1630. This entry was posted in Argentina, Brazil, Paraguay and tagged Asuncion to Puerto Iguazu border crossing. Bookmark the permalink. I loved all the pictures, Chris. The falls are so beautiful, and your red shirt is still looking good! Way to go– nice to track your travels on the map and see the red line go up.